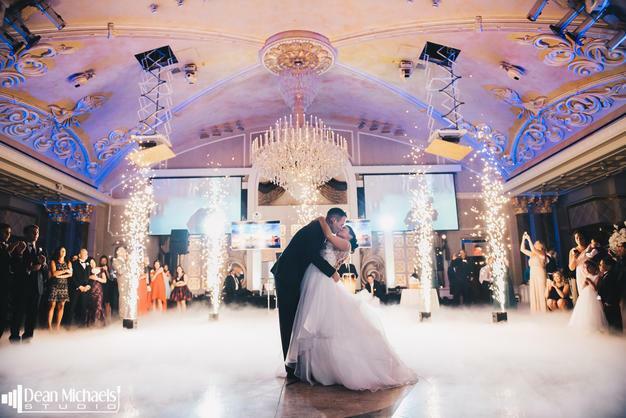 Pyrotechnics – Mystical Entertainments indoor pyrotechnic rentals can create a truly dramatic entrance for your wedding, Sweet 16, and any other event in NJ. Our indoor pyrotechnic rentals are completely safe and will not create excessive heat or set off fire alarms. Tip: Use NJ Event Designs indoor pyrotechnic rental during your first wedding dance. As the singer hits the “high note” our professional technician will fire off the indoor pyrotechnics for that “wow” effect. With our brand-new, state of the art system, there is no longer a need to worry about fire or smoke. Our new smokeless, flameless systems are the ONLY way to go for your pyrotechnic rentals in New Jersey or New York. Your guests will be shocked and awed by the beauty of our incredible firework system. Indoor wedding fireworks, also known as indoor wedding pyrotechnics or even gerbs, will make an amazing addition to your wedding reception. Our sparklers look amazing for your first dance, entrance or even exit. Fully programmable for different shows with up to 36 units at a time. We can program wave effects, fountain effects, back to front, middle to back, whatever!! No system compares to our new high tech technology…be the first to book sparklers for your NY NJ CT wedding today!! With our indoor safe, cold sparkler machine rentals, your New York or New Jersey event will be a hit!! Safe and cold to the touch, our state of the art cold sparkler machines can be started and stopped with the touch of a button. Blast off for your grand entrance, first dance or party moments and our 10′ (adjustable height) cold sparks will wow your guests. Book now! !